Feel like your party décor needs a little extra oomph? 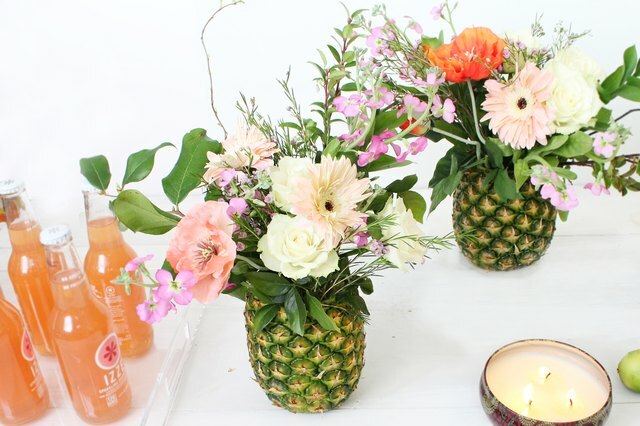 With a quick trip to the grocery store you can create unique pineapple arrangements that look like they were styled by a professional florist. These tropical vases will add a luxe element to any special event, from a birthday party to a bridal shower. 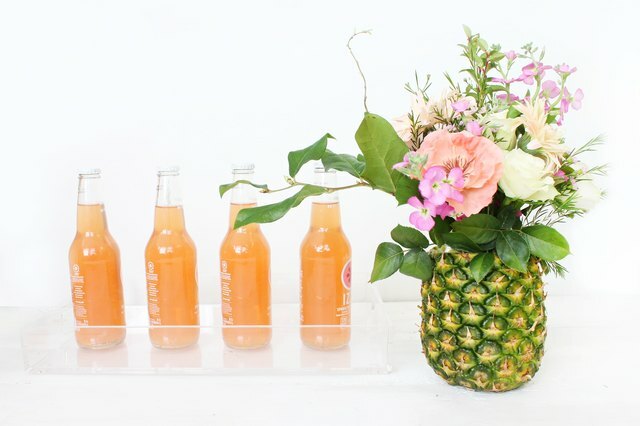 You can even spray paint the fruits to coordinate with your décor! When selecting pineapples at the grocery store, look for fruits that are not overripe and can stand upright on a flat surface without tipping over or wobbling. When you get home, wash the surface of the fruits with soap and water to remove dirt and grime. 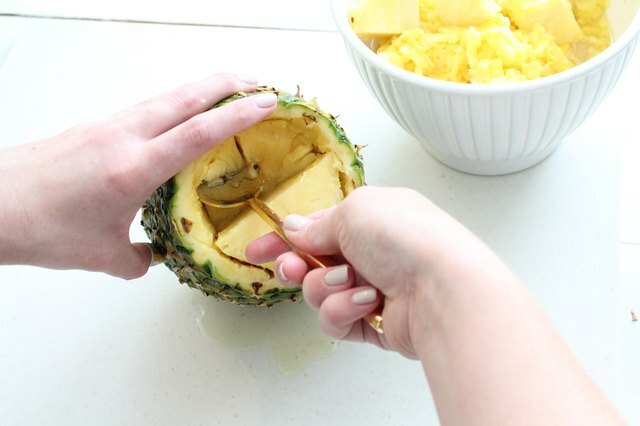 Lay the pineapple on its side and use a sharp knife to remove the leafy top. Cut about three inches down from where the pineapple starts to create a tall vase or halfway down the fruit for a shorter vase. If you plan on making several arrangements, consider varying their height to add visual interest to a table. Carefully cut around the fruit half an inch from the outer edge and then make several diagonal cuts to create triangular slices that can be easily removed. Keep a damp dishcloth handy to wipe up the sticky pineapple juice. Use a metal spoon to scoop out chunks of the fruit into a large mixing bowl. Save the fruit for a cocktail recipe or freeze for your morning smoothie! 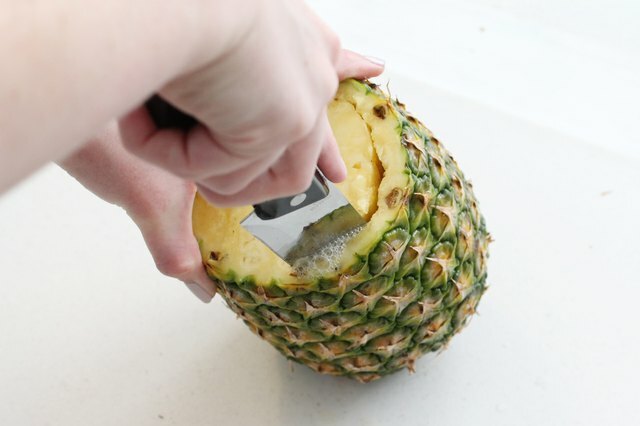 You may need to use your knife to loosen the core sections to completely hollow out the the pineapple. 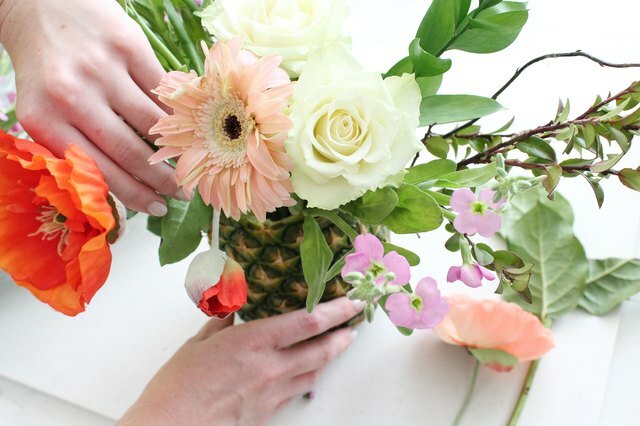 Protect your flowers from the acidity of the pineapple juice by inserting a drinking glass or recycled jar into the opening. You may find a little extra scooping is required to get it to sit level within the fruit and not be visible from the top of the vase. 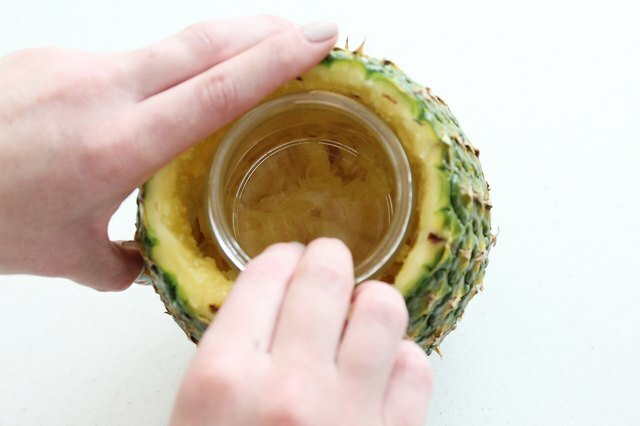 Fill the jar inside the pineapple with clean water about one inch below the rim. Use scissors or floral shears to cut down the stems of the fresh flowers and arrange them in the vase. 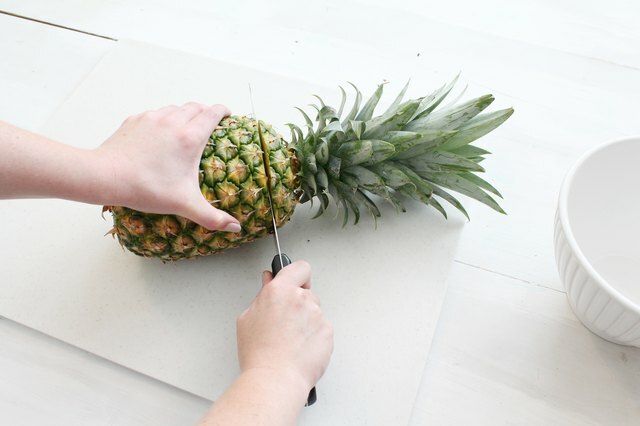 Start with your greenery pieces to build the framework of the arrangement, allowing some of the leafy spray to hang over the lip of the pineapple. Add in your large flower stems last for professional results! 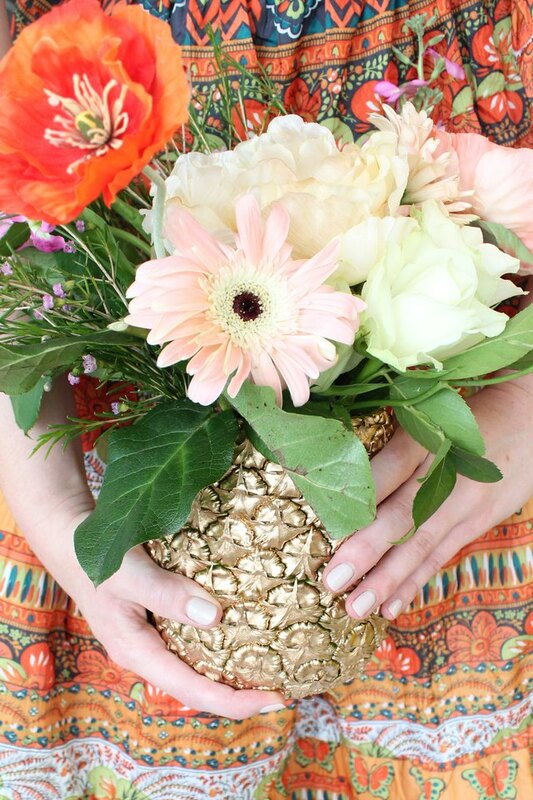 Add a glistening touch to your tablescape by painting your pineapple vases gold. 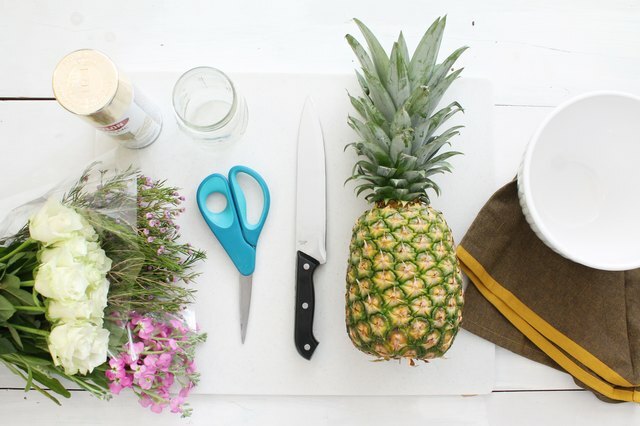 Fill a hollowed out pineapple with paper towels to absorb any juice and turn the fruit upside down on a drop cloth or scrap piece of cardboard. 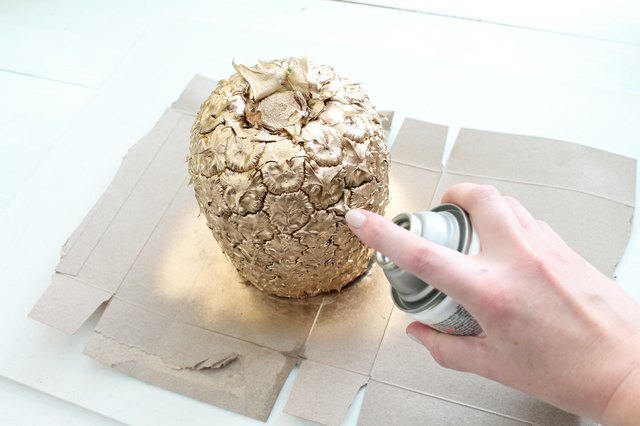 Apply several light coats of gold spray paint in a sweeping motion to achieve even coverage. Allow paint to dry completely before arranging your flowers and styling on your table. 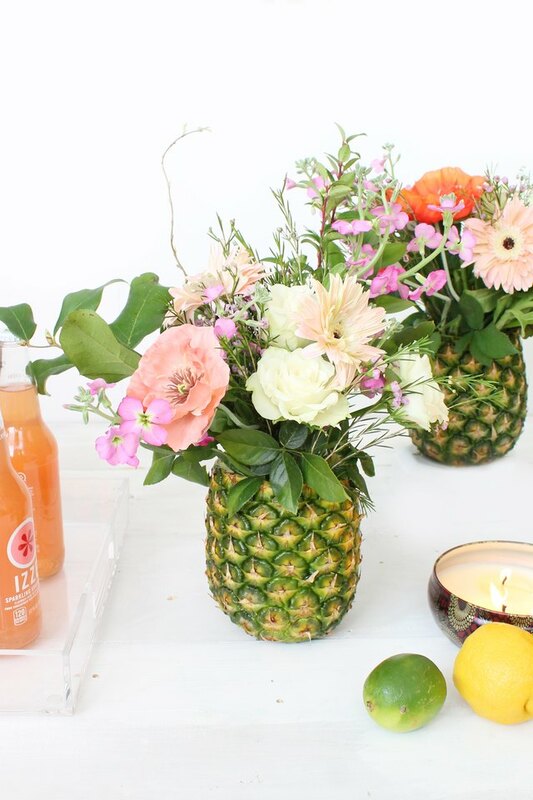 I love how these whimsical pineapple flower vases look grouped with other bright décor and fresh fruits on banquet tables. 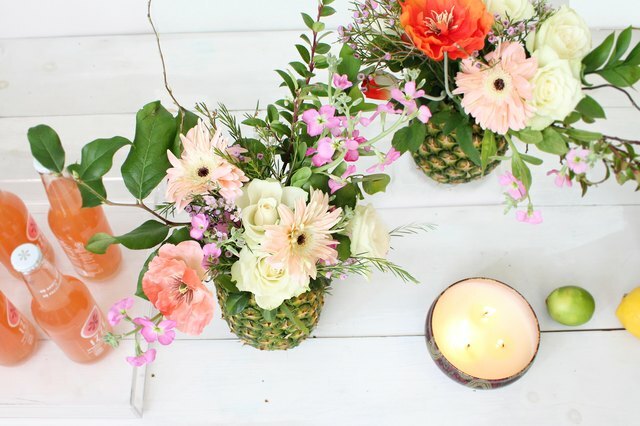 Not having a party but love the tropical look? 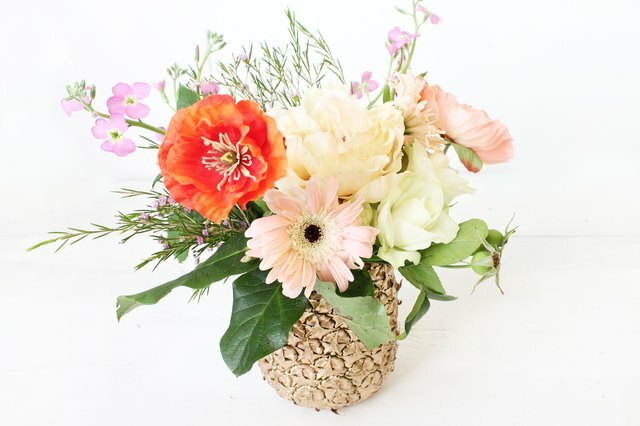 Hand deliver a pineapple vase of seasonal blooms to friends as a sweet surprise that will brighten up their kitchen counter.